Designer Kyemah McEntyre (l) designed Power and BET Backstage Host Naturi Naughton’s Dress for the 2015 BET Awards. 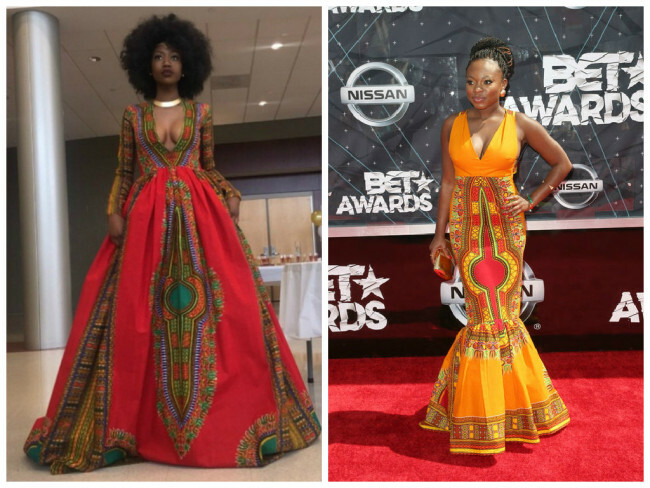 Fresh from our fabulous files, Power star Naturi Naughton made a bold statement at the 2015 BET Awards, choosing to wear an African inspired dress by Internet sensation and teen designer Kyemah McEntyre. You may remember McEntyre’s African inspired prom dress that went viral on the Internet because of the beauty, detail and quality of the work. McEntyre’s overall look was topped off by by a beautiful natural hairstyle (afro) and make-up. In a word, the young lady was fierce. Naughton, who hails from McEntyre’s home state of New Jersey, commissioned McEntyre to create a custom gown for the star for the 2015 BET Awards. The Twitterverse lit up when Naughton appeared on the red carpet, wearing a multicolored mermaid style gown designed by McEntyre. Naughton topped off the beautiful look with a braided updo. Kudos to Naughton, star of a hit television show, for hiring a dynamic, young black woman to design a gown for such a special occasion. Supporting young people in their endeavors is always hot. The award for best decision, best dress and best heart goes to Naughton. This post was written by Nsenga K. Burton, Ph.D., founder & editor-in-chief of the award-winning news blog, the Burton Wire. Follow her on Twitter @Ntellectual.